To martial arts practitioners around the world, Grandmaster Chan Pui is known for many things, such as being sixth generation of the Wah Lum Kung Fu System, 33rd generation disciple of the Shaolin Temple, and being a pioneer in traditional martial arts in the United States. To his students, Grandmaster Chan is known for his dedication to his system, pride in his students, enthusiasm in training and teaching, and sincere respect for martial artists. Those who know Grandmaster Chan know him to be a powerful practitioner, an astounding performer, an honorable man, and a true friend. Communists imprisoned his parents, and Pui had to leave school and go to work. While working and continuing his kung fu training, he taught himself to read Chinese, and learned at this early age to persevere through hardships. After becoming an accomplished martial artist, Chan Pui escaped from China to Hong Kong, and from Hong Kong, set sail for America with no money, but with courage, ambition, and a dream. After arriving in Boston, Massachusetts, in 1968, Pui took a job as a cook, and learned to speak and write English. He started performing lion dances for Chinese New Year celebrations in Boston’s Chinatown, and soon started teaching kung fu at the Bamboo Hut Sports Association. In 1970, he opened his first school, becoming one of the leading pioneers in introducing martial arts to the United States. From the start, Pui emulated the traditional teaching style from Master Lee Kwan Shan, stressing good basics for a strong foundation. 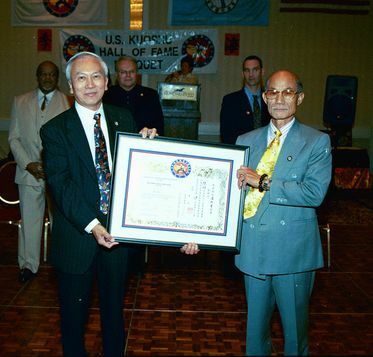 Grandmaster Chan’s school flourished, and he became well known and highly regarded in both the Chinese and English communities in Boston. Then Pui’s dream grew; he wanted to build an authentic Chinese kung fu temple, with the potential to house live-in students and provide a well-rounded training environment. In 1980, when Pui decided to move his family to Orlando, Florida, he realized this dream, and seized the opportunity to build what he envisioned. The new headquarters of the system, referred to as the Wah Lum Temple, boasts a simple yet beautiful garden surrounding outdoor training areas, which encase the indoor training room. Bamboo plants grow around tall posts used for training balance, and a charming, intricate waterfall pond is home to Chinese Koi Carp. This peaceful setting is used for traditional and professional live-in students of both kung fu and tai chi. A dormitory is available for professional live-in students, many of whom travel from around the world to experience training with the Wah Lum System. Since then, pupils of Grandmaster Chan Pui have opened schools around the world, under the Wah Lum name, now totaling more than 30. Much more than just a business, this training system continues Pui’s dream to encourage dedicated martial artists to share the Wah Lum philosophy and training to achieve maximum potential in the art.